Grounded on the solid Earth, we often seem disconnected from the skies above, which merely act as a revolving backdrop to the dramas of everyday life. In Heaven’s Touch, James B. Kaler aims to redress this notion, explaining how objects in space can influence the environments found on Earth. Kaler begins by comprehensively explaining the effects of various Solar System bodies upon the Earth; the gravitational influences exerted by the Moon, Sun and other planets, and the impact of solar radiation. Although informative, I found these early chapters stodgy and a lot of effort to absorb; at no point was I gripped with the desire to read further. Kaler’s occasionally overly descriptive and flowery language does not help, being at odds with the fairly prosaic material, and doesn’t always lend itself to explaining certain concepts, particularly given the lack of diagrams throughout the book. Between chapters five and nine however, when explaining more hypothetical or unlikely events (most of which wouldn’t touch our lives, so much as bludgeon them out of existence), Kaler really hits his stride. The topics in these chapters – asteroid and comet impacts, cosmic rays, supernova and hypernova – are explained elegantly and with far more panache than those in earlier chapters, though a lot of the material has been covered by other popular science books, such as Phil Plait’s Death from the Skies! The final chapter gives a (very) brief history of the Universe, slightly labouring the point that the wider Universe influences the Earth, through the implication that without the Universe, Earth would not exist. As this is true almost by definition, it does seem to generalise Kaler’s proposition that the Earth is affected by celestial phenomena to point of redundancy. At this point, greater analysis of the books central tenet, that ‘we are under the constant influence of the cosmos’ may have been preferable. Although overall both interesting and informative, there are some surprising omissions from the book. Panspermia – surely the ultimate example of Earth possibly being influenced by something from space – is barely mentioned, and then only in context of material transference between the terrestrial Solar System planets. As Kaler mentions other highly improbable occurrences, such as the possibility of a hypernovae occurring in the vicinity of Earth, it makes panspermia appear conspicuous by its absence. 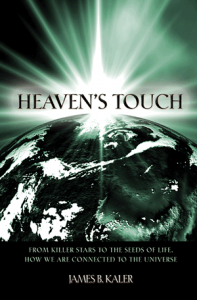 For someone new to this topic, ‘Heavens Touch’ is a good introduction to how the Earth interacts with the wider Universe, but for those with much prior knowledge of celestial mechanics it is unlikely to hold any startling revelations.